We’d love your help. Let us know what’s wrong with this preview of Oi Dog! by Kes & Claire Gray. Frog is changing the rules...Dogs no longer sit on frogs. Phew! Dogs now sit on logs - and everyone else is going to have to sit somewhere different too. 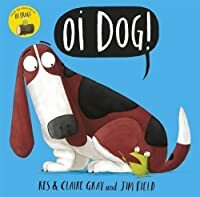 To ask other readers questions about Oi Dog!, please sign up. Be the first to ask a question about Oi Dog! By Jim Field’s daft, expressive faces. Of a menagerie of bums! We’ll find out where he’d CHOOSE to sit. A perfect book with top-drawer rhyme. And you wil Hooray! A Long-awaited sequel! You’ll find this is the book you’re after. So, cats sit on gnats, moths sit on cloth, fleas sit on peas and even more bizarre, crazy and stupid ones. ABSOLUTE BLISS, GO AN' ENJOY YERSELVES CHUMS. This review has been hidden because it contains spoilers. To view it, click here. Greatly developed characters, dark humor and chilling twist. Such a read! I received a copy of this title from Hachette Australia for review. 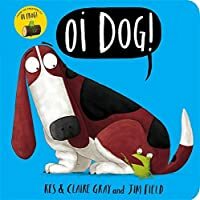 If you loved the word-twisting, rhyme-busting, sit-a-thon that was Oi Frog!, you will definitely appreciate the humour (and the fairness of the new rules) presented in Oi Dog! Without giving too much away, this is essentially the exact same story as the earlier book, with animals coerced I received a copy of this title from Hachette Australia for review. 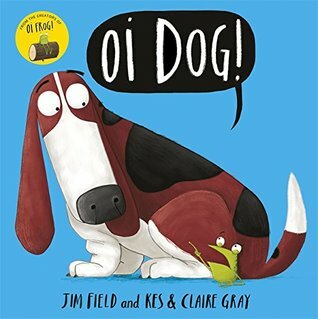 If you loved the word-twisting, rhyme-busting, sit-a-thon that was Oi Frog!, you will definitely appreciate the humour (and the fairness of the new rules) presented in Oi Dog! Without giving too much away, this is essentially the exact same story as the earlier book, with animals coerced into sitting on objects that rhyme with their name, capped off with a funny, off-beat twist at the end. I had forgotten how funny the facial expressions of the various ill-seated animals are and that provided a good laugh throughout. Frog is fed up with where dog’s seating arrangements and turning the tables on bossy Cat, devises a new seating plan for the animals. Having given up his place on the log for Dog, Frog has to find new seats for everyone, and Cat for one is not happy with his new resting place. This is wonderful sequel to Oi, Frog! with a whole host of new animals who are having to comply with the hilarious new seating plan devised by a rather fed up Frog. The rhyming couplets lend a lovely flow to the book, making it easy to read and easy to follow, and allowing for suggestions of where other animals might sit, to be discussed with active and imaginative young minds. My children were soon joining in with ‘reading’ after only a couple of readings of the book. And it is a book that elicits calls of ‘read it again’ straight after the last lines. The illustrations perfectly match the text, with the expression of a put upon Cat and a rather perplexed Whale, adding to the story, eliciting giggles when seen in junction with the story being read. Children will love this book; it has bright, colourful pictures and it is also funny. In the story, the frog wants to change the rules of where different animals can sit, as opposed to cats just sitting on mats. The rhyming in this book makes it funnier and also makes it to flow. Children will particularly like the end of the story, which doesn't rhyme unlike the rest of the book, and is regarding where frogs can sit. One of my daughter's favorite books right now. We have read it over and over and she can almost recite it from memory. Each animal is given a rhyming item to sit on with a surprise at the end. Although it follows the book Oi Frog you don't have to have read both for this one to be a lot of fun to read. I read this book to a year 1 class that I was with for placement. The children were all engaged as they had previously read other versions already. The story was about different animals sitting on various objects that rhyme with their animal names. They were anything wild or silly which made some of the children laugh. This occurred on every page of the book. This book was a great opportunity for phonics as children could pick up graphemes and phonemes that rhyme. This could be useful for a phoni I read this book to a year 1 class that I was with for placement. The children were all engaged as they had previously read other versions already. The story was about different animals sitting on various objects that rhyme with their animal names. They were anything wild or silly which made some of the children laugh. This occurred on every page of the book. This book was a great opportunity for phonics as children could pick up graphemes and phonemes that rhyme. This could be useful for a phonics lesson by reading out a rhyming couplet and asking children if they are able to come up with their own. This will help them remember new phonemes/graphemes being taught. Some fun wordplay and hilarious illustrations! A really good book I've found to be particularly for year one pupil. The use of rhyming as the main structure of the book introduces rhyme schemes to the year group. The use of rhyming is also very engaging as the children are more likely to remember the story through understanding of the rhymes for each animal. Consequently it allows them to begin to recognise that the same sounds may have different spellings and vice versa. The use of pictures also adds to the engagement, as it fragments the n A really good book I've found to be particularly for year one pupil. The use of rhyming as the main structure of the book introduces rhyme schemes to the year group. The use of rhyming is also very engaging as the children are more likely to remember the story through understanding of the rhymes for each animal. Consequently it allows them to begin to recognise that the same sounds may have different spellings and vice versa. The use of pictures also adds to the engagement, as it fragments the need for long pieces of text, which would prove to be hard for a 5/6 year old to read. Also provides scope for comprehension activities - creating a verse or two with rhyme and a picture to add to the story - encouraging creativity and understanding about different rhyming words. Jen liked it. she sat and listen to most of it before she wandered off. which is good going. She did bring it back to me to finish later. I think it would be great for work on rhyming and predicting, particularly at the end and maybe even mak I discovered this book on a training session at work with an English and reading consultant and had to buy a copy for myself! Already have loads of ideas how I'll use it in school with my lovely class and I'm sure they'll love it too! We read Oi Cat! first and she loved it. I think the difference with that one was the there was more inter-play between the characters as well as the fold-out funny at the end. She hasn't been all that interested in Oi Frog! or Oi Dog! (although Oi Dog! starts to get a bit more character to it). Her favourite part of the book was actually the inner cover looking at the different pictures ofthe dog and giggling at him farting or chewing on slippers. Miss 3 and I like to explore different books and We read Oi Cat! first and she loved it. I think the difference with that one was the there was more inter-play between the characters as well as the fold-out funny at the end. She hasn't been all that interested in Oi Frog! or Oi Dog! (although Oi Dog! starts to get a bit more character to it). Her favourite part of the book was actually the inner cover looking at the different pictures ofthe dog and giggling at him farting or chewing on slippers. More wonderful illustrations, including endpapers, from Jim Field, such juicy slugs, such an expressive dog. Frog has had enough of being sat on and decides to change the rules. Instead of sitting on frogs, dogs will sit on logs, cats will sit on gnats, bears will sit on stairs etc. Cat and dog listen to frog as he explains where all the other animals must sit. At the end, dog asks what frogs are going to sit on, he says ‘sun loungers’. Very humorous book with lots of rhyme and repetition. Can also look at books by same author - Oi Cat, Oi Frog, Quick Quack Quentin. This book is an excellent read to young children. It is useful book to read to children when learning repetition and also the children will be able to remember some of the words that are repeated throughout. Oi Dog! has lovely illustrations that go perfectly with the words within the book. Definitely recommend! What a funny and sweet book. A great book to use to introduce rhyme to a class in an amusing way, and something other than rhyming poetry. Lovely illustrations to accompany the story and a witty ending. Really lovely book. I can't decide which is better - this or Oi Frog! So many great pictures and cheekiness in this one. Lovely clear, bold illustrations. Lots of rhyme and repetition to make it memorable. The three characters come across clearly in this simple little exchange with a fun little twist at the end. A great picture book, with bright colourful illustrations, which is a brilliant addition to phonics lessons. Very funny all the class will love this book! This one was a mouthful, but it was enjoyed by the children and amusing to me. I think this one might acutally be funnier than the first one, Oi Frog! I adore the ending and delight in when my daughter chooses it for bedtime reading! I thought Oi Frog! was funny, but it's all made even better by this wonderful sequel. Full of fun rhymes and pictures that will make both you and whomever you're reading it to (or just yourself for that matter... I love reading them myself) smile and pause to look before the next page. Another genius book by Gray! Great rhymes with a funny end, very amusing pictures. I can imagine this could be read and enjoyed many times. This book is so richly full of rhyming! Lots of language for children to enjoy and a very amusing twist at the end!